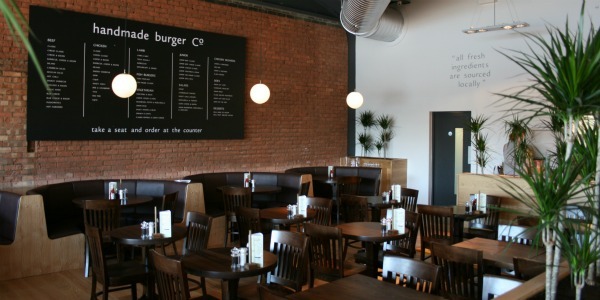 The handmade burger Co., located on Brayford Wharf, is almost ready to open its doors on Thursday, July 7. The restaurant stands where Tootsies used to be and it will create 30 jobs. Staff have been training together for the last six weeks. The new restaurant is the chains first to open in Lincolnshire, and offers diners more than 40 different burgers, made from scratch and hand pressed in the restaurant every single day. The menu features 100% prime Scotch beef handmade patties, an exclusive Jimmy’s Farm rare-breed beef range, a wide vegetarian variety and a childrens menu. A preview of the inside dining area. Chris Sargeant, Owner of Handmade Burger Co. said “We are delighted to be opening in Lincoln this week and we can’t wait to find out what Lincolnshire thinks of our new restaurant. First opened in the Midlands in 2005, the family-owned and run restaurant chain is committed to sourcing produce from the British farmers, with the owner regularly visiting farmers to ensure that the company stands by its fresh food philosophy.